According to the American Dental Association (ADA) flossing in an essential part of caring for your teeth and gums. Flossing cleans in in between your teeth and gets into those areas that brushing alone cannot reach. It’s also proven to remove the debris that can contribute to plaque buildup. Therefore, when you floss you reduce the risk of tooth decay and gum disease. But, did you know there is a right way and wrong way to do it? Here are the do’s and don’ts of flossing your teeth. Use around 18 inches of floss, which is approximately the length of your arm from the tip of your middle finger to your elbow. Wind the floss around the middle fingers of both hands leaving an inch or two in the middle to work with. Hold the floss between your thumbs and pointer finger to slide gently up and down between your teeth. Use clean sections of floss as you move carefully from tooth to tooth. Avoid snapping the gum line. Make a C-shape around the tooth and gently clean slightly below the gum line as well. Use a gentle back and forth motion to remove the floss up and out. If you have dental work, consider sliding out at the gum line, so you don’t knock anything loose or pop anything off. Do use enough floss, about 18 inches. Do make sure to be gentle so that you avoid bruising your gums. Do get below the gumline where plaque hides. Do use products with the ADA seal of approval because they are tested and proven safe and effective. Do thread the floss out through the bottom of tight teeth or to avoid pulling out fillings or crowns. Do ask for guidance or a lesson from your dentist or hygienist. They are happy to help! Do encourage kids to floss so that they develop good habits from an early age. Do make flossing a daily habit. Don’t be overly aggressive. Be patient at first, with practice you will get faster and more efficient. Don’t be worried if your gums bleed at first. The more you floss, the healthier your gums become, therefore will bleed less. Don’t skimp on the amount of floss you use. Use a clean section between each tooth. Don’t be too concerned which comes first, flossing or brushing. It is a personal preference. Don’t forget to floss every day. The importance of this daily habit cannot be stressed enough! Nylon floss is that traditional sting-like floss and is available both waxed and unwaxed. It is also offered in a variety of flavors. PTFE floss is made of Teflon in a single filament. It is also available flavored. The type you use is a personal preference. 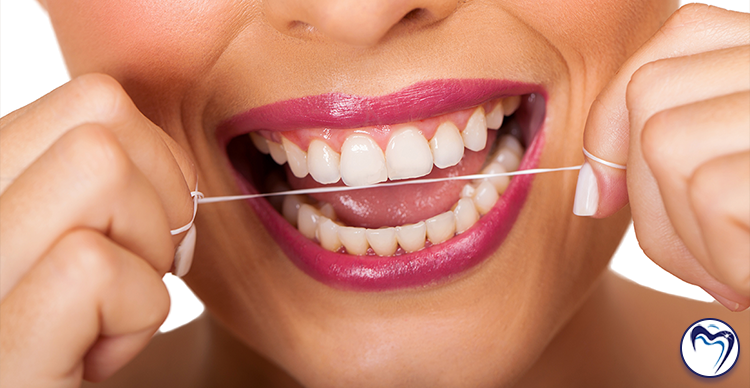 The nylon floss is composed of many strands and may tear or shred if your teeth are especially tight. PTFE is slightly more expensive but glides smoothly between teeth. When used correctly both types are effective at remove plaque and particles. Still have questions about flossing technique, types of floss or how to teach your kids how to floss? Ask the team at Denise Dental Studio. Our friendly and knowledgeable staff is here to assist with all your dental needs. We understand the importance of proper brushing and flossing your teeth and flossing, coupled with yearly dental exams. Together we can all work together to keep your smile healthy! Contact us today for an appointment.